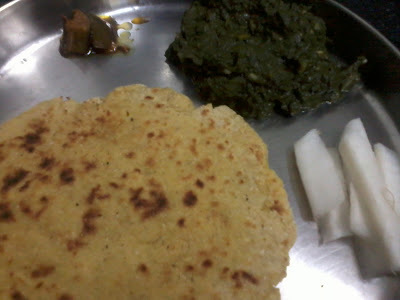 The winters are here (well, almost here for Mumbaikars) and it's time to eat some sarson ka saag and makke ki roti. This recipe has become pretty famous in my family and among friends and every season I end up making it multiple times. Recently, my husband took help of a friend for train reservations (yes, it's a huge challenge in India to get last minute train tickets) and when he asked how can he return the favour, the friend asked for some sarson ka saag. 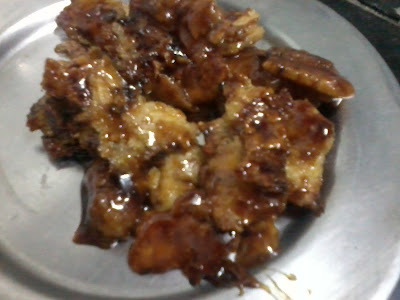 So, here I am sharing the recipe with you. Try it, eat it and let me know how was it. You can also send me the pictures at kavitamehrotra05 (at) gmail (dot) com. I would love to see them. Boil sarson, spinach, bathua and chana saag together and grind into paste. Heat oil in a pan and add chopped onions, garlic, ginger, green chillies and 2 tbsp makke ka atta. Chop cauliflower and add that too. When the onions are fried add the saag paste and salt and let it cook for 10-15 minutes. Make soft dough of makke ka atta with luke warm water. Mix the boiled potatoes too so the dough binds well. Make round rotis with hands and cook them on a pan. It is a dessert enjoyed after the meal and helps digestion too. Take two makke ki rotis and break them into pieces. Heat a pan and mix these pieces with jaggery and desi ghee and cook till jaggery melts. Garnish the saag with white butter and serve with makke ki roti. Enjoy this Punjabi speciality with buttermilk or mattha and sliced radish on the side. My favourite.....I really love it.